Mankato students D.C.-bound with "Odyssey"
Clayton Oliver Rutschow (flexing his bicep) and a bevy of other passionate student actors from Minnesota State University-Mankato are D.C. bound. 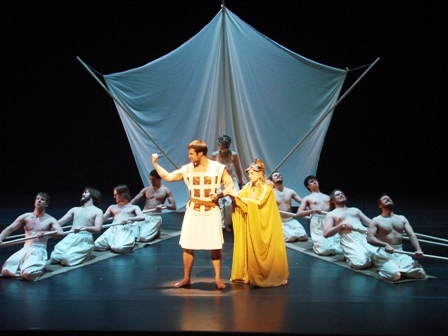 Rutschow plays wandering warrior Odysseus in the school production of "The Odyssey" that has been tapped for a special performance at the Kennedy Center. It is one of only four college productions chosen from throughout the nation. The MSU - Mankato show, based on an adaptation by Mary Zimmerman, beat out nearly 200 others in a regional festival to nab the honor. The performance takes place on Thursday, April 21, in the nation's capital. The last MSU - Mankato production to be invited to the festival was "Round Trip Ticket" in 1976. Minnesota audiences get a chance to see the staging by theater department chair Paul J. Hustoles, in a tune-up performance Monday, April 18, at the Ted Paul Theatre on MSU - Mankato campus. Call 507-389-6661 or go to Cost for tickets is $10 www.msutheatre.com for more info.